“There is a great sense of community within the Montessori classroom, where children of differing ages work together in an atmosphere of cooperation rather than competitiveness." Montessori is both a philosophy of child development and a method of applying that philosophy in an educational setting to guide a child’s growth. 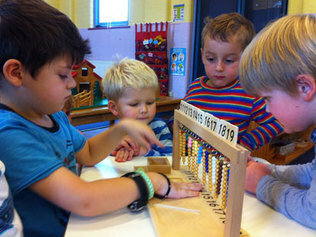 Montessori classrooms at all levels are dynamic communities of learners and guides. The child possesses an unusual sensitivity and an intellectual ability to learn from his/her environment. At our Montessori academy, learning is based on the child’s experience within the environment, and not on the teacher’s teaching. Our environment is designed to meet the needs, interests, and abilities of the children within the class. Children are encouraged to choose their activities from a wide variety of prepared materials in a carefully planned and structured environment. The emphasis is on cultivating awareness, independence, and responsibility in a multi-age community. The learning curriculum includes planned activities in everyday living skills, sensorimotor development, language arts, mathematical thinking and cultural subjects. Children enjoy interacting with nature and engaging in music, movement, art and Spanish as a second language. 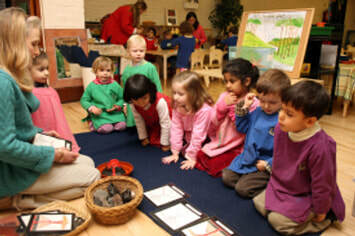 Our preschool teachers see themselves as guides and facilitators of children’s learning. Teachers prepare the learning environment, assist children in making choices, and observe and record progress in order to better follow the interests and needs of each individual. The language materials in our primary classrooms use a phonetic approach, highlighting the sounds of the letters that allow children to move effortlessly into reading. The children at this level are taught phonemic awareness in a fun and interesting manner through hands-on language activities that include matching, sorting, and labeling of pictures and cards. Children are provided vocabulary and nomenclature cards in the classroom in relation to the materials used in all subject areas, such as geometry, science, geography, botany, culture, etc. 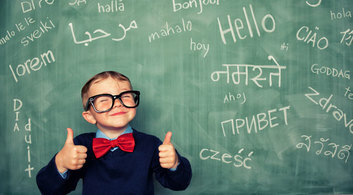 Spoken language is developed as children communicate with each other individually and in small groups. Vocabulary cards and daily occurrence of reading books to the children in small and large groups provide enrichment of vocabulary. Enrichment of vocabulary across the curriculum is a constant focus in the primary classroom. Handwriting is practiced through tracing sandpaper letters, shapes, and using chalkboards. Moveable alphabet letters are used for creating words. In our primary classroom, children experience writing before reading, gaining an ability to create words as they develop reading skills. This strategy is a whole language approach that helps children become independent readers. At our Montessori school, the mathematics materials are concrete and provide children the sensorial impressions of quantities, numbers, combinations of numbers, and mathematical operations. Math activities include 1-to-10 sequences; quantity, numeral names, combinations of ten and teens; introduction to the decimal system; and the operations of addition, multiplication, subtraction, and division. Children explore fractional equivalences and the fractional names with manipulative materials. Working with a wide variety of concrete math materials gives sensorial impression and tangible experiences to the children. Certain materials such as square chains and cube chains help them to gain visual and tactile impressions to explore and internalize the concepts of squaring, square root, cubing, and cube root, preparing them for more complex mathematical operations. This practical application of sensory-based learning is the most significant factor that helps children develops their mathematical minds at an early age. 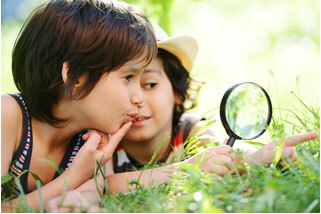 At the Primary level, sensorial exploration and experimentation is the key as children learn about the natural world. The activities developing basic skills of science, such as measuring, comparing, classifying, and keen observing are carefully prepared and practiced in our Montessori classrooms. The work is accompanied by extensive classified nomenclature helping children build their vocabulary while developing observation skills. Nature studies include the concept of living and non-living and an introduction to the plant and animal kingdoms. Primary children study the basic characteristics and attributes of animals and plants. They learn the scientific nomenclature of the parts of a flower, tree, leaf as well as the different kind and shapes of leaves. Children also learn fundamental classifications of vertebrates/invertebrates too. Some basic concepts of physical science are introduced to them as well. Scientific experiments, research and observations assist children in pursuing their own interests among a wide range of cultural subjects. The sciences, from botany to physics, are incredibly important to our student’s understanding of our physical world. Dr. Montessori believed that the key to a peaceful world is held within the peaceful child. Igniting the spirit of global citizenship in children will develop peace and harmony, making the world a better place to live in. In Montessori environment, children exploring cultural activities including maps, music, food, and artifacts of different countries and cultures build awareness of the world around them. The diversity of our children, in conjunction with the cultural materials help them develop a respect for all people. Cultural studies cultivate the child’s fascination with the universe and help them develop a lifelong interest in observing nature and discovering more about the world in which we live. The curriculum of cultural studies includes an introduction to different subjects like botany, zoology, history, geography etc. The study of cultural subjects bring an appreciation of nature and the environment among the children and provide knowledge that all living and non-living beings in the universe are interdependent and interrelated to each other. History: The concept of what happened in the past; history is first introduced to the children by explaining their own timeline. Books related to history when read to the children give a better and clear understanding of the events that occurred in the past. Different topics introduced in history are then well understood by the children. Geography: The Montessori geography materials are concrete providing sensorial impressions of the world. Manipulating these sensorial geography materials give children a clear understanding of the world in which we live. The young children are first introduced to globes where they can have a visual and tactile experience of the rth. Other sensorial materials and puzzle maps are used by the children to explore the continents of our world, the countries of each continent, and the states of our own country. Geographical materials give understanding of land and water formations on the earth. Children also create key land and water forms such as lakes, islands, peninsulas etc. Geography vocabulary is given both orally and with prepared nomenclature cards that are used by the children as an integrated part of their language work. The children are introduced to the diversity of international cultures by means of stories, songs, celebrations, pictures, and artifacts. Botany: Children learn the scientific nomenclature of the parts of a flower, tree, leaf as well as the different kinds and shapes of leaves. The study of germination gives them the understanding of plant’s needs for their growth and survival. Planting in the garden and watering the plants give children firsthand experience of nurturing them and understanding their growth. 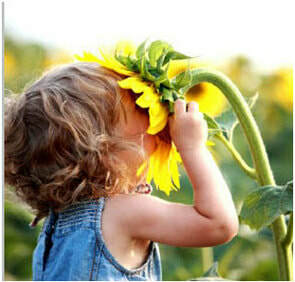 The child understands the entire world around him using his senses. The sensorial materials isolate impressions of taste, sight, smell, touch and hearing and allow children to develop a deeper awareness of their world, while building vocabulary around these distinguishing characteristics. These materials assist children in refining their sensory experiences from awareness of taste, to visual and auditory discrimination, to the development of fine motor skills required for writing. Each level provides the children with age-appropriate materials that stimulate their senses, encouraging them to explore and build on the impressions they have already acquired. These materials allow children to pursue their natural tendency to classify sensorial impressions and sort by size, shape, color, touch, sound, and weight. The sensorial materials isolate specific qualities, have a built-in control of error and make abstract qualities concrete. The repetition of sensorial activities lays a foundation for math, geometry, geography, botany, and music. the child, engaging them in the meaningful learning of life skills. Preliminary Exercises - preparing the fine motor skills for more challenging activities. These activities include spooning, pouring, stringing, sorting etc. Care of the Environment - learning to respect and care for the materials in the space where the child lives and learns. Activities include sweeping, dusting, washing, polishing, food preparation and more. Care of the Person - learning the basics of self-care skills such as hand washing, dressing himself, tying shoe laces, nutrition and more. Grace and Courtesy - learning of social skills such as walking carefully, communicating skills, manners, table setting, hosting a guest and more. Through these common activities, the children learn to concentrate, develop fine motor skills, learn the order and sequence of steps and become confident learners, moving toward greater challenges with enthusiasm. The Montessori Method encourages independence, assisting children in gaining the skills to care for their personal needs, care for the environment, and care for their peers with grace and courtesy. All programs at Blossoms Montessori incorporate art, beauty, appreciation, and aesthetics as part of the core Montessori curriculum. Painting, drawing, singing, and craft-making are the part of every child’s experience, fostered by educators who specialize in each of these areas. A range of art materials and activities are available to students. 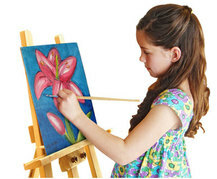 Children demonstrate progression in artworks as their skills develop. Cutting exercises move from very simple to quite complex exercises. Pasting work is followed later by a collage. Coloring with various media such as pencils, crayons, pastels is available and handwork, including sewing is taught. Seasonal inspirations using different media are a prominent feature in our primary classrooms. The children are introduced to the diversity ​of international cultures by means of stories, songs, celebrations, pictures, and artifacts. Daily music lessons help the children learn the sounds and meanings of words. Music also helps strengthen memory skills. Movement to music helps children build motor skills while allowing them to practice self-expression. Music and Movement offer children many ways to express themselves, their feelings, experiences and ideas. Care of the body is equally as important as challenging the mind. Some of the ways to gain physical development are: Playing, building, jumping, stooping, skipping, running, swinging, ball play, group games and more. ​Movement is built into all Montessori activities allowing the child to develop gross motor as well as fine motor skills. Energetic playtime emerging social skills and teamwork among children is harmonious and fun.